Graebert™ GmbH – a pioneer in developing high-performance Computer Aided Design (CAD) solutions across desktop, mobile and cloud, announced the launch of its FxARX ™ Application Programming Interface (FxARX API), a new API offering developers the possibility to reuse with no modification C++ code written for AutoCAD®’s ObjectARX® programming environment. possibility to reuse with no modification C++ code written for AutoCAD®’s ObjectARX® programming environment. 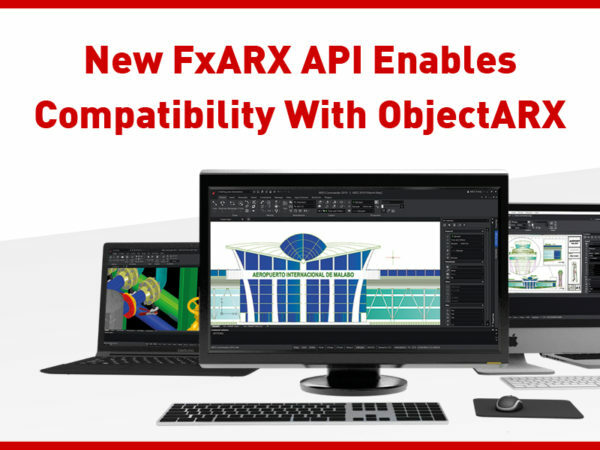 The FxARX API will allow developers to run their programs with ARES Commander, Graebert’s flagship CAD solution for DWG-editing. The ability to use the same code will facilitate a quick and effortless migration. It allows also the developers to migrate their users smoothly as they keep the possibility to sell the plugin for both platforms. Multiple applications have already been using this API under strict Non-Disclosure Agreement over the last months and the first launches are expected in the first half of 2019 after the release of ARES Commander 2019 in January. Using the FxARX API will only require to rebuild the plugin using the same code. “Graebert’s ambition is to offer full coverage of ObjectARX C++ and the first version supports already large and complex applications. All common namespaces such as AcRx, AcAp, AcCm, AcDb, AcEd, AcGe, AcGi, AcGs, AcUt and Ads are supported as well as custom entities and objects, Jigs and hidden lines. The User Interface customizations, docking widgets and dialogs are also supported” said Dr. Robert Graebert the Chief Technical Officer of Graebert. Onshape®. The new FxARX API will therefore open Graebert’s very cost-effective business model to thousands of potential new partners. Developers interested in trying out the FxARX API can contact Graebert and get an early access.